Normally my family walks and runs for Breast Cancer. Well, I don’t exactly run. I am more of the baker in the family. My niece Jill runs, like the wind! She is also in this video, one of many. She is the third generation in our family to be diagnosed with breast cancer. She is our advocate, and my hero. A special thanks to Domenick Casuccio for the video. So, go on over and see my muffin recipe, and hear our story. what amazing cause Veronica!! nice history and lovely muffin!! peace with you! 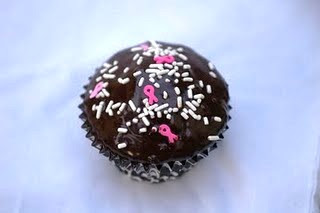 Anything topped with ganache is something I am for… Great cause! This looks great. Healthy, but with frosting. Even better.